Country’s largest cellular carrier Bharti Airtel has joined the 3G tariff war, as the company started to offer 3G speed on 2G packs. As far as we know, Airtel is testing this in Delhi circle with selected customers, and with user feedback Airtel may go in the similar way. 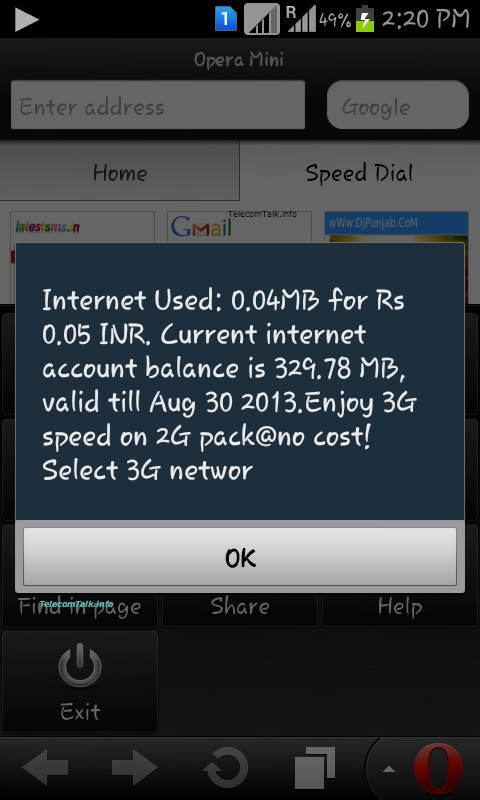 It seems Reliance Communications has taken the charge of changing the 3G market dynamics. Rcom’s try to bring data revolution by offering 3G speed at 2G Price was unique, though many analysts did not welcome the move. However BSNL moved Reliance’s way, and launched unified 2G and 3G data plans across India. When BSNL launched such plans, with its pan India coverage (Delhi & Mumbai via MTNL), no 3G operator can ignore this. I believe in coming days all 3G players – Vodafone, Idea, Tata Docomo will offer unified data plans. Tested by: SS [Rynolds Martin], Neha & Vishal Jain. Airtel may be planning to give 3g speed at the price of 2g, but have you looked at the pricing of 3g in other states. seems like airtel is recovering it smoney from other states…if u dont believe see the 3g pricing of AIRTEL in UP east . 1024mb @ rs 346…….this is pathetic pricing…seems like they are digging their own grave when it comes to business in these areas.